Print efficiently with AccurioPro Flux. The flexible solution for your print room. Whether you want to automate your prepress, edit print jobs within your team or set up an online print shop, we have the right product for you. Your flexibility is important to us: Start with our entry-level product and switch to a different product if needed. Our software solution grows with your needs. AccurioPro Flux Essential offers all you need for efficient prepress processes. The automation of recurring tasks and centralized control of all production machines will multiply the productivity of your print room. Don't adjust the print settings for every single job manually. Instead you can save combinations of print settings including impositioning (e.g. booklets, business cards) as products. Avoid printing problems resulting from incorrect PDF files. During import all documents are automatically checked for missing fonts, images with a resolution too low and transparencies. 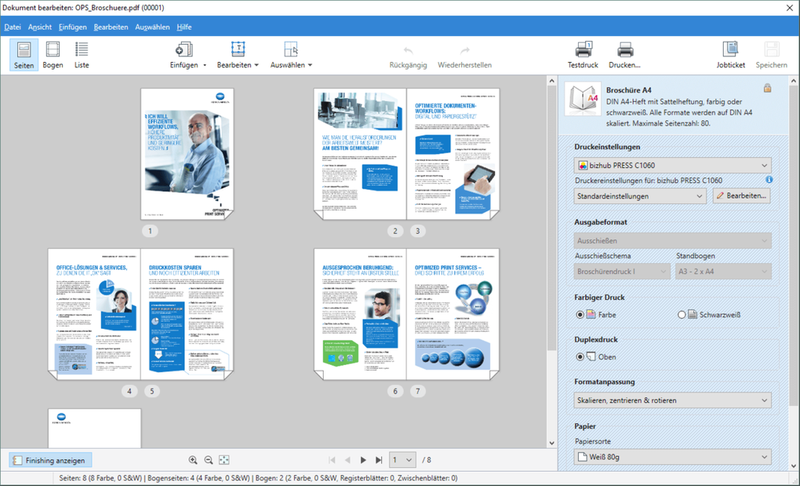 Share a folder in your network which is linked with a print product. 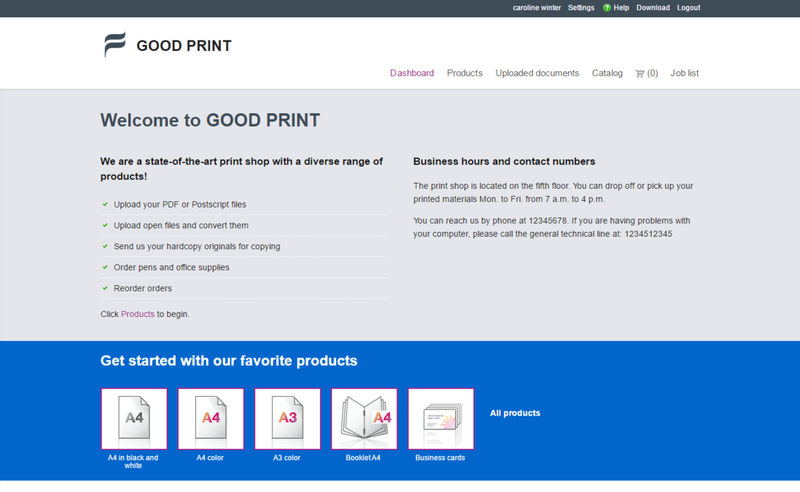 The result: All documents, that your users put in there, are uploaded with the print settings automatically applied. They arrive print-ready! Your print file needs some extra editing? You don't need to switch to another tool: Rearrange pages and sheets. Add pages from external PDF files. Insert tab sheets and label them easily. You can even use an external application from within the programm. Optimize the utilization of your production machines by organizing them in printer clusters. Print jobs are distributed evenly across all machines in one cluster, even taking the device's individual printing speed into account. 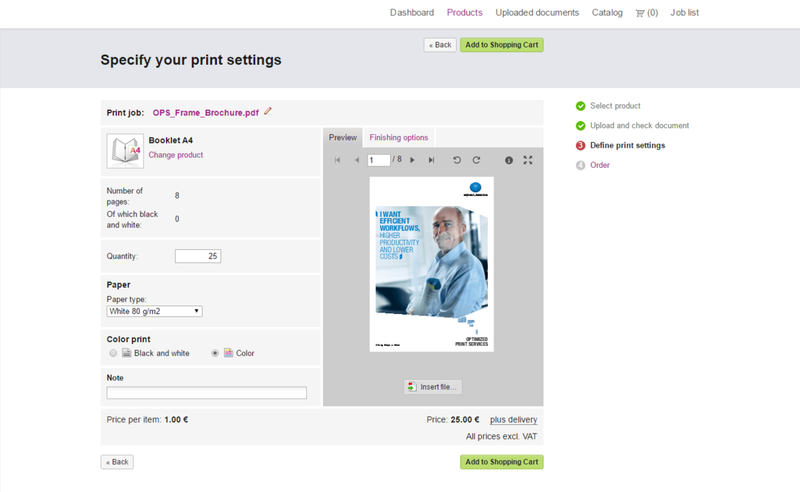 A split between color and b/w printers using the color status of the individual pages is also possible. Did you invest a lot of time to configure a proper paper catalog at your printing machine? Good news: Import the whole catalog and use it in our software. All print jobs are listed in the main window to guarantee a perfect overview. But for special tasks you can create custom filters, which show only the required parts of the job list. For example, create a filter to see only jobs that are assigned to a certain printing device. We provide full support for Konica Minolta controllers. Save time by adjusting all color management settings within the application without the need to switch to the controller. Save settings for convenient reuse. Our software solution is optimized for output on production machines from Konica Minolta. In addition, you can also connect printing devices from other manufacturers. This allows you to centrally control all machines in your print room. 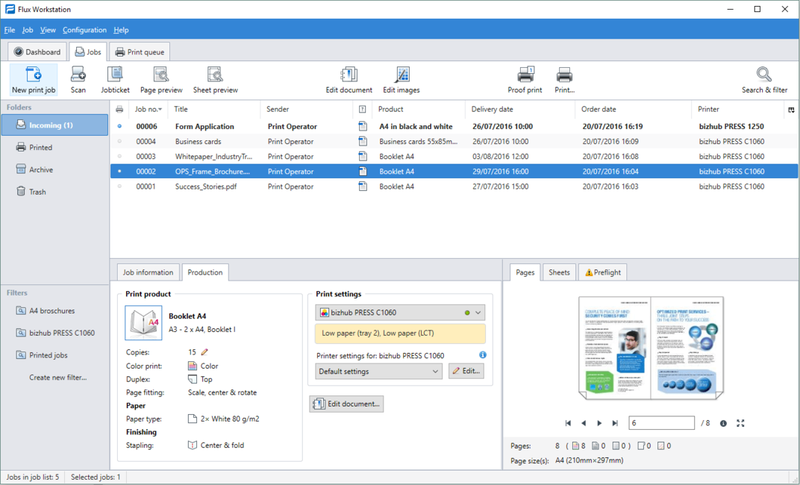 AccurioPro Flux Premium includes in addition to the prepress module a powerful server that enables you to receive print jobs from clients within your company network and organize print jobs within your team. Comprehensive reports help you to optimize your print room. Every operator in your team has a personal account. By assigning print jobs to an operator it is visible for the whole team who is working on which job. Three operators can work at different PCs simultaneously. If your team is larger, you can purchase additional Flux Multi Seat licenses. Import native data streams directly in our application by using a hot folder. The data streams are stored permanently and can also be printed several times if necessary. The following formats are supported: PCL, PS and PDF. 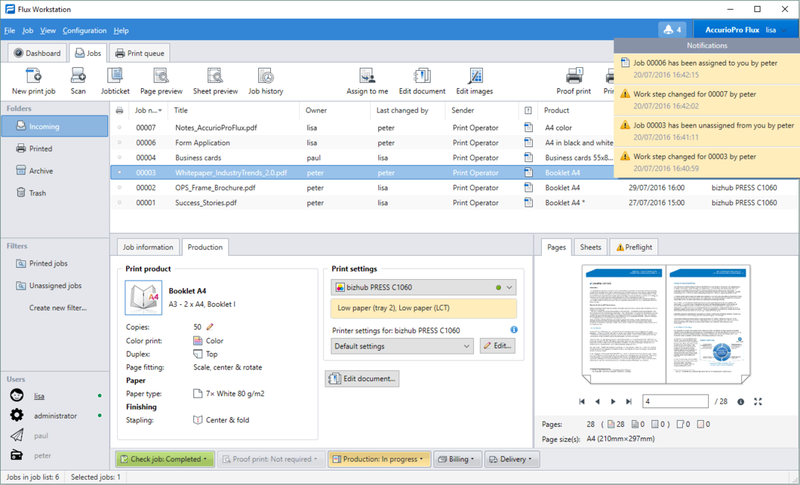 Clients are virtual printers on your users' PCs. Users just send their print files directly from their applications using the familiar print dialog. This automatically converts the files to PDF and they arrive print-ready at your desk. Keep in touch with your users easily. Inform them about the status of their print job by sending them updates via email automatically as soon as a work step is finished. You can select from a list of predefined work steps. 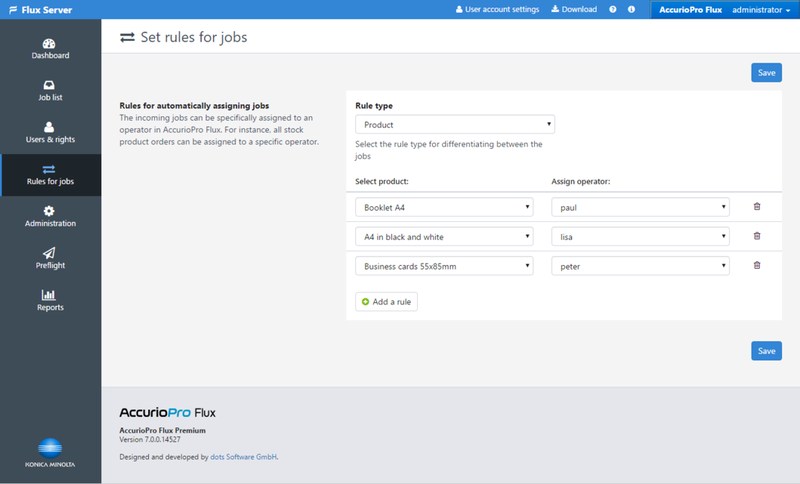 Automatically assign jobs to an operator with the help of predefined rules. The rules can be created for products or – in case you use the web-to-print module in AccurioPro Flux Ultimate – for user groups. 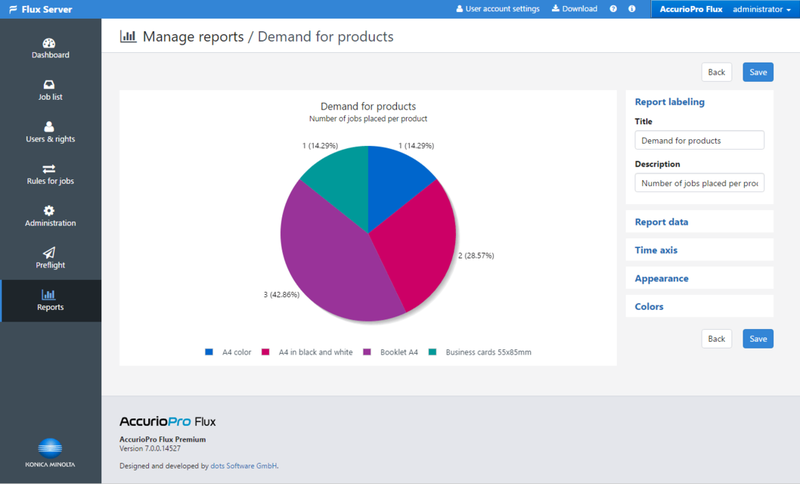 Make use of all stored data and create your own graphical reports with the help of an included assistant. The assistant allows to create and change reports easily and flexibly. Choose between different chart types. Access print jobs directly from the panel of the printing device. You can check, preview and edit all jobs, which are assigned to the particular device. Start printing or forward the job to another device. You have full flexibility and can decide whether you prefer to manage jobs on a PC or at the printer. Create your own user roles and add corresponding rights, for example the right to edit the configuration or the right to manage users. It is completely flexible. 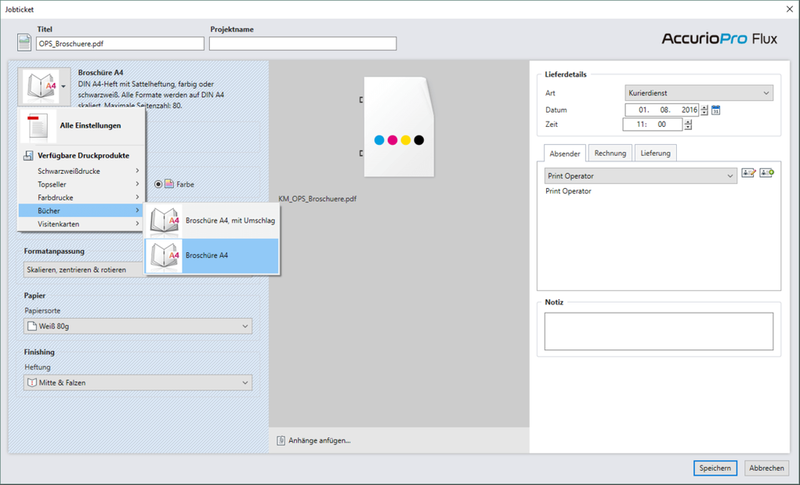 AccurioPro Flux additionally includes an easy to use online print shop to the basic and workflow module. Offer comfortable 24/7 online ordering to your users. It is optimized for commercial printers offering their services to business clients (B2B) and in-house print shops of public institutions, universities and corporations. All documents uploaded by your users are automatically checked for missing fonts, images with a resolution too low and transparencies. Define if you want to accept or decline orders that include detected problems. 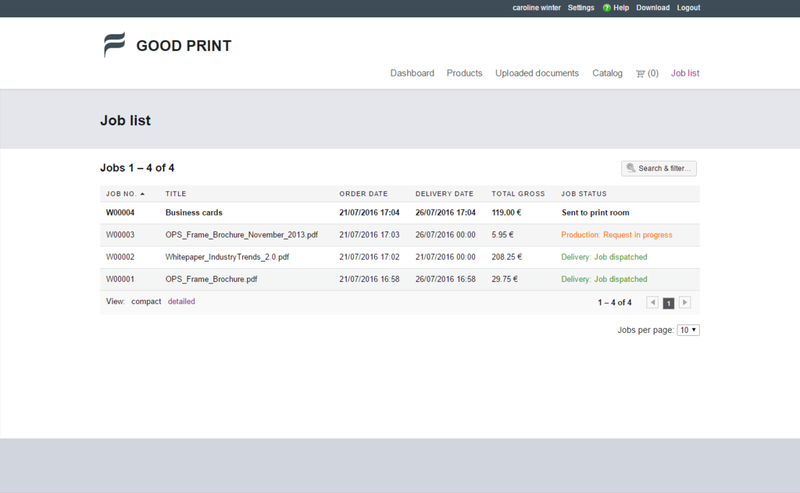 After uploading their print files, your users can check them in a preview. You have full flexibility in pricing. Make use of price scales for quantity discounts and set a global and/or product-related VAT rate. For internal cost allocation you can define an account field. Customize your offers per user group. For each user group you can offer individual selection of products, prices, delivery options and catalogs. Choose an order workflow and add an approval workflow, if needed. Integrate the online shop easily in your established IT environment. Connect an Active Directory server with the online shop via LDAP to make use of existing user databases. Use the single sign-on feature to offer comfortable authentication. Make your customers feel at home. Choose between eight themes and customize them, if you wish. Add your own logo and choose your own title for the shop. Additionally you can customize the login page and the user's dashboard. Offer personalized print products to your customers like business cards. You can provide editable text fields and place holders for the upload of logos or images. You need more functions? Add more options! Enhance your chosen product with additional options. There are several options for each product available. Edit documents with a powerful raster graphics editor. Buy Flux Multi Seat licenses to work with more than three operators simultaneously. Connect to the accounting solutions SafeQ, Pcounter or PaperCut. Use the fully integrated preflight engine of pdfToolbox by callas to detect and fix PDF problems and avoid production errors. No external application needed. Connect the external preflight application PitStop Server (Enfocus). Integrate 3rd party applications like external web-to-print solutions. Integrate the color management functions of AccurioPro Color Care Server (CCS). Set up multiple shops and customize their storefronts. Offer individual products, prices and catalogs. Accept up to 300 file formats in the web-to-print module. We keep improving our software. You can benefit from future features with a Software Maintenance Plan (SMP), which is available for each product and option separately. It includes free updates, upgrades and service releases. All customers with a valid Software Maintenance Plan using a previous version can upgrade to the new version free of charge! Leave your data and a local partner of Konica Minolta will get in touch with you to provide a demo version. The demo version contains the full range of functions and is valid for 30 days. *This customer uses a previous version of AccurioPro Flux, labeled with the old name "Printgroove JT Suite". We have been developing software solutions for production printing for more than 20 years. That means more than 20 years of experience, continuous development and permanent user feedback. We are part of Konica Minolta. With the backup of this global corporation we can focus on our essential mission of developing innovative software solutions. Our software is distributed by Konica Minolta within Europe, in the US, in Australia and New Zealand, in Japan, Central Asia, in the Middle East and Africa.